♥ For hi-fi speaker systems, a single driver capable of covering the complete frequency range from 800Hz to 4 KHz is essential. ♥ Avoiding any crossover point within this mid-range band is necessary to avoid sound quality impairment by different drivers. ♥ A flat frequency response with even dispersion and phase characteristics in this range is also important to keep the sound integrity. 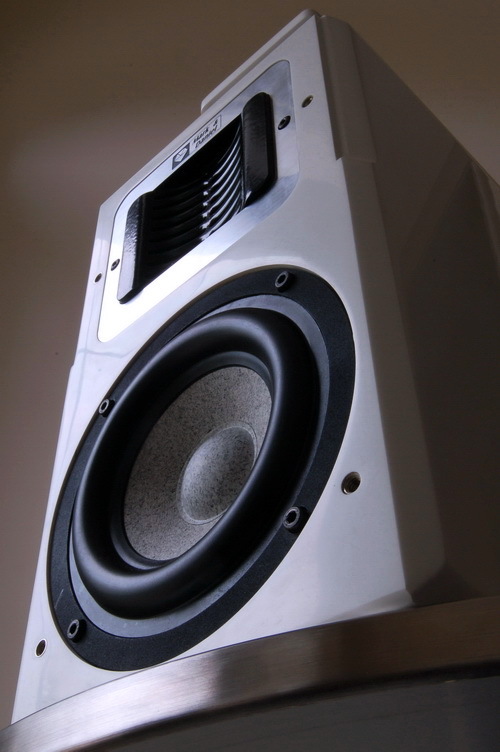 To properly implement these requirements for a two-way speaker system, we need to either find an wideband tweeter that is capable of covering the spectrum from 800Hz to 20KHz (to cover about 5 octaves), or to build an unique woofer that may satisfactorily respond from 40Hz up to 4KHz (for over 6 octaves). Due to many physical and fabricating limitations, there are only a handful of such drivers available at very high cost which may be meet these critical targets. Most speaker manufacturers today have no choice but to compromise their 2-way speakers by selecting a crossover point within this very sensitive Mid Frequency band (typically, inserted somewhere between 1.5KHz to 3.5KHz). This unfortunate audio engineering compromise is suddenly a relic of the past, for now Mark & Daniel has created the wideband Dreams AMT driver! !